All Indians are waiting to see the live action of Indian Grand prix. This article gives you the latest updates of Indian grand prix which scheduled to be held on 30th October 2011. Read the article full for latest updates. We all see a grand prix tournament in televisions with International racers like Michael Schumacher, Sebastian Vettel who is the No 1 in current standings. Now its time to watch the Indian grand prix which will be held at New Delhi in Buddh International Circuit. 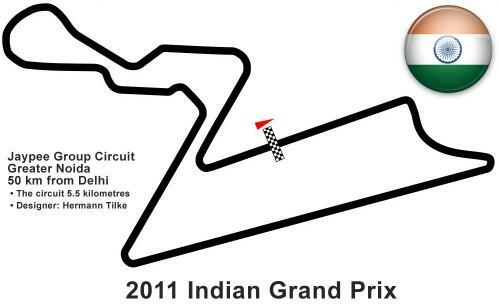 Indian Grand prix race date is fixed and will be held on 30th October 2011 Practice session of Indian grand prix tournament will be on 28th October 2011. Qualifying tournament will be conducted on 29th October 2011 and the final race will be on 30th October 2011. The designer of Indian F1 track was done by Hermann Tilke. All major drivers are satisfied with the track. One of the happiest person in Indian F1 racing will be Narain Karthikeyan who is waiting for a long time to participate in his home ground. "It is a new sort of philosophy with this overtaking, with getting the circuits very wide at the entry,"
"It offers a good tactical perspective for overtaking, for having a good show, and hopefully make the Indian fans enjoy Formula One after this weekend." The last sector looks very different, it looks very quick. Reality is very different to the simulator, so we will see tomorrow." "People say 'what is the motivation' but we are racing for the Grand Prix of India and it's the first time we are racing here,"
Like it or not Formula one has come to stay imagine what it can do to India in terms of popularity ,revenue earned,being one among the first world countries status. Formula 1 ND Ra-one [shah ruck khan] are currently making news in India .But Ra-one is fiction[reel] , formula one is real.vroooooom here goes F1.Some one said F1 can do to India what it self could not do for so many years.